A homeless 73-year-old woman has been given a place to stay in Chester after a huge response to a post about her on Facebook. The elderly lady entered The Share Shop in Chester to ask if they had any ‘suspended coffees’ available. They did and the member of staff got talking to her and found out that she had been sleeping in her car with everything she owned since the end of November after being evicted from her home in Northwich. 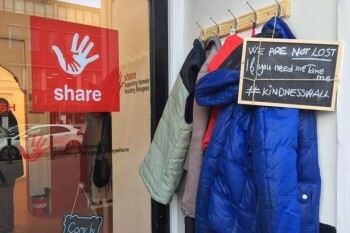 The Share Shop posted about the lady's plight on Facebook and it was shared over 1,700 times, with the result that Chester Aid to the Homeless came forward and found a flat in the city centre for her. Lovely human story, just shows compassion is alive and well.